On top of being a buzzword in certain parts of the cultural world for few years now, audience development is one of the new priorities of Creative Europe. It brings for the first time audiences/ spectators/ users/ citizens/ participants under the spotlight, on an equal footing with artists and cultural organisations. Current experience existing in the cultural sector (inside and outside our programme), is fascinating, although fragmented and scattered across the continent. The Creative Europe unit in DG EAC felt that it was time to reflect together with the cultural sector on this topic, which is an essential vector for the relevance and sustainability of any cultural entity (at the financial, social and even cultural levels). 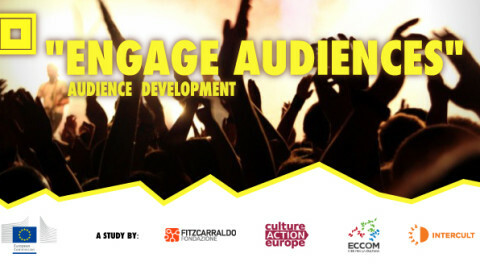 The “Study on audience development – How to place audiences at the centre of cultural organisations” was undertaken by a consortium led by Fondazione Fitzcarraldo, together with Culture Action Europe, ECCOM and Intercult. The aim of the study is to provide innovative approaches in the area of audience development, possibly providing a basis for selection criteria in future calls for proposals launched by the Creative Europe programme. Moreover, the study aims to equip cultural leaders with the means to make a convincing case within their organization, for becoming more audience-centric; and to investigate peer-learning opportunities. The training will give an overview of the study findings, including desk research, catalogue of good practices and the toolkit for audience development/ engagement. Speaker: Alessandra Gariboldi, Coordinator for research and consulting, Fondazione Fitzcarraldo.